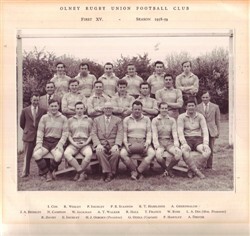 Olney RFC 1st XV, black and white team line-up photograph season 1958-59. Back row: I. Cox, R. Wesley, P. Inchley, P.R. Stanton, R.T. Haseldine, A. Greenhalgh. Middle row: J.A. Brimley, N. Campion, W. Jackman, A.T. Walker, R. Hall, T. France, W. Rose, L.A. Dix (Honorary Treasurer). Front row: R. Davey, E. Inchley, H.J. Osborn (President), G. Odell (Captain), P. Hartley, A. Driver. Item: Two photographs of Ray Longland. Olney and England player. Item: Our Sportsmen's Gallery. H.J. Simcoe. Item: Match Programme Northampton v Olney Sat 6 January 1900 . Item: Our Sportsmen's Gallery. No. 10. H. Clifton. Item: Our Sportsmen's Gallery, No.9 Sam Kitchener. Item: Olney RFC youth team, 1974/75. Item: Olney RFC youth team, unknown date. Item: Olney RFC 25th Anniversary 1972 Mini and Juniors Section 1997, Under 7's. Item: Olney RFC 25th Anniversary 1972 Mini and Juniors Section 1997, Under 10's. Item: Olney RFC 25th Anniversary 1972 Mini and Juniors Section 1997, Under 9's. Item: Olney RFC 25th Anniversary 1972 Mini and Juniors Section 1997, Under 8's. Item: Olney RFC 25th Anniversary Mini and Junior Section 1972-1997: Under 12 Team Photo. Item: Olney RFC 25th Anniversary 1972 Mini and Juniors Section 1997, Under 15/16's. Item: Olney Ladies XV 2003-04, East Midlands 3 League Champions.